Ask a Korean! : Baekseju, the "100 Year Wine"
Baekseju, the "100 Year Wine"
What is the deal with 'bek sae ju'? I am told that drinking this 'hundred-year-wine' can help you live longer. Are there any actual health benefits to drinking this beverage? How did it get its reputation/name? You inadvertently stumbled onto a highly interesting example of how a Korean product manages to recall Korea's tradition and repackage it for modern day customers. A traveler was walking by a road, when he saw a young man had an old man stood up with his pants sleeves rolled up, and was whipping the old man with a switch. The traveler became indignant with the young man's insolence, chastised: "How dare you lay your switch on this old man's leg!" The young man replied: "This here is my precious only son, whom I had at age 80. And he is turning old like this because he did not drink this wine like I told him. So I am trying to teach him a lesson." This is a cool story reflective of the kind of ironic humor commonly found in traditional Korea. But the real story is how the modern baekseju appeared in the market. 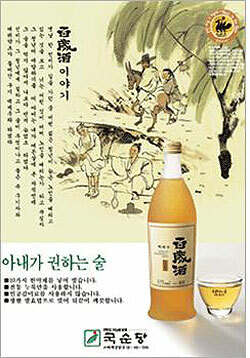 Baekseju is made by a company called Kooksoondang [국순당] Brewery Co., a company that focuses on brewing traditional wine. Before Kooksoondang decided to mass produce baekseju, the wine was no more than a moonshine recipe available only in small pockets of Korea. Importantly, although Kooksoondang made its baekseju based on the traditional recipe, it added plenty of its own adjustments to come up with what would sell in the broader market. The company put out the wine in the market in 1992, and advertised it with a nifty poster re-telling the story from Jibong'yuseol. The result was a huge success. In the early 1990s, there were pretty much only three types of alcohol available in Korean market -- beer, soju and whiskey. Baekseju was perfectly positioned to hit the market for people who wanted to drink but not get shitfaced. (For those who wanted something a bit stronger than baekseju, a popular alternative was quickly hatched -- "osipseju" ("50 year wine"), made by mixing soju and baekseju one-to-one.) The good-for-your-health was a nice narrative to accompany the product, enforcing the message that if you want to avoid hangover the next morning, go with baekseju. Thanks to baekseju, Kooksoondang grew 100 times in terms of revenue since 1992, and has now become the dominant market leader in traditional Korean wine of all kinds. One can fairly say that baekseju opened the door for the rediscovery of Korean traditional wine, although baekseju itself might not be particularly authentic. Is baekseju actually good for your health? It might be possible -- it is not particularly strong (about 13 percent alcohol), and its ingredients do include many herbs used in traditional medicine. The company does claim that, based on its own experiments, baekseju is just as good as red wine in cancer prevention, and also protects the stomach lining. But at the end of the day, alcohol is alcohol -- it can only be so good for one's health. Instead of thinking too much about the supposed health benefits, one should drink baekseju as a toast to how tradition, a solid product and nifty marketing combined to create one of the most successful products in Korean alcohol market.